"Seasons change...but nothing really changes after all." 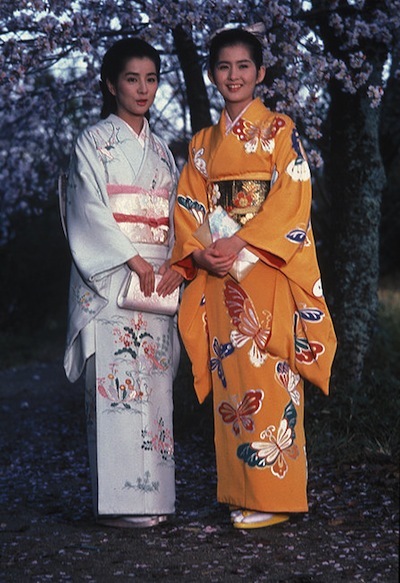 Kon Ichikawa's 1983 drama The Makioka Sisters is the very epitome of understated grace. This story of four sisters in the years prior to World War II underscores its inherent melodrama with a soft-spoken calm that is mesmerizing in its own unassuming way. The movie starts in 1938. The four Makioka siblings have lost both of their parents. 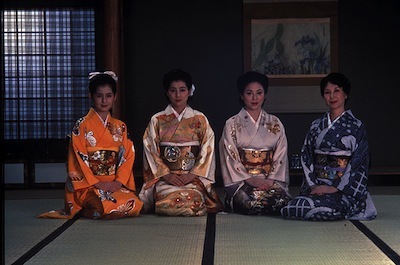 The two eldest girls, Tsuruko (Keiko Kishi) and Sachiko (Yoshiko Sakuma), are both married, while their younger sisters, Yukiko (Sayuri Yoshinaga) and Taeko (Yuko Kotegawa), are not. Yukiko is regularly meeting suitors, but if she's not rejecting them for her own reasons, Tsuruko is ending the engagements because she thinks the potential husbands are beneath her family's standing. What their standing is exactly is up to some debate. The family kimono business was in debt when their father died, and Tsuruko's husband Tatsuo (Juzo Itami) had to sell it off. The girls should not have the same pride of money they once had, since they don't have the same amount of money. Yukiko and Taeko, who is 24 at this time, have a dowry in trust, but they actually have to find husbands to get the cash. There is a natural divide between the sisters, one that is indicated by age. The older women have a more natural bond, while the younger women seem to be closer. Yukiko and Taeko moved out of their eldest sister's house five years prior after a scandal involving Taeko running off to elope with a jeweler's no-good son. She has since carried on a clandestine romance with him, though her affections are straying. It is likely a generational indication that the youngest girl is also becoming the most self-sufficient. Taeko is a budding artist with a growing business making high-end dolls. Much of the conflict between the sisters comes with keeping up appearances. On one extreme, Tsuruko carries on as if she is still the daughter of a wealthy artisan. On another, Sachiko turns a blind eye to her husband, Teinosuke (Koji Ishizaka), having an inappropriate infatuation with Yukiko. Meanwhile, Taeko secretly smokes and keeps a studio away from home where her boyfriends come to meet her. Kon Ichikawa co-wrote The Makioka Sisters with Shinya Hidaka, and the script is adapted from a popular novel by Junichiro Tanizaki. The film has the austerity of an Ozu movie, but the familial relationships are also pure golden-age Hollywood. The Makioka Sisters could have been a pretty good melodramatic feature for the likes of Bette Davis or a Joseph Mankewicz vehicle, something along the line of A Letter to Three Wives , or even a Douglas Sirk production. Under Ichikawa's guiding hand, it's a much more restrained affair. While keeping up those appearances, very little is said that is meant. The sisters dance around the issues, and they employ dramatics when necessary. Tsuruko, for instance, breaks down in front of her husband to get her way; when she tries similar exaggerations with Sachiko at the start of The Makioka Sisters, the other girl sees right through them. The movie is rarely as warm as the few times the older siblings laugh together. For as small as the action can be, Ichikawa builds a large canvas for his production. The sets are huge, and the interiors go way back in the frame, giving the viewer a real sense of how high on the hog the Makioka girls have been living. Ichikawa and his cameraman Kiyoshi Hasegawa often shoot from a middle distance, fixed in position, observing from the edge of the room. They let the lives play themselves out, they don't push the material forward. Within that, the filmmakers also take their time observing the surrounding details--the trees, wall decorations, kimono fabric. They remember to stop and smell the cherry blossoms, as it were, to mark the beauty of life that exists all around its subjects. The ensemble cast in The Makioka Sisters is remarkable. Not only are they believable as siblings, but their carefully measured performances do render the various emotional shades of the story with considerable--and considered--technique. So much of what is required of them is meant to stay under the surface, so at least half of each performance is silent glances and telling gestures. Each actress does well establishing her personality within the unit. No one really shines over the others, though we remember them for all the right reasons. Sayuri Yoshinaga's sweetness inspires us to recall Yukiko fondly, while Yoshiko Sakuma's warmth makes us feel sorry for Sachiko, to realize how difficult her position in the family often is. I suppose if I had to pick, Yuko Kotegawa's portrayal of Taeko is the most memorable, only because she harnesses the girl's inner struggle and somehow makes her dreams of a romantic life come true. Then again, her character also gets the most modern arc--which is fitting, as she is the most modern sister. Lots of heavy plot twists go down in the final hour of The Makioka Sisters. Each of the women is faced with various choices, and though they approach them with the same heavy resignation as they would have in the first hour, the potential consequences only gain weight as the story progresses. While in some ways, this emotional restraint maybe makes The Makioka Sisters seem a little slow at first, you will likely be simultaneously impressed by how quickly the time passes and how much you find yourself invested in the Makiokas' travails. The movie's ending is bittersweet, though I find myself flipping back and forth whether it's worst for those who were pushed forward reluctantly or those who were ready to leave the past behind for a brave new world. That's the sting of nostalgia: it validates and invalidates personal growth in equal measure. 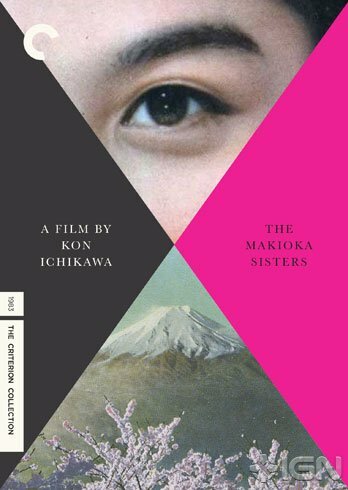 Criterion's superlative 1.85:1 transfer for The Makioka Sisters shows an incredible level of detail. The image goes deep, with lots of visible specific background and foreground information. You'll notice so much even in just the opening scene: the rain falling outside, glimpsed through a doorway in the back wall behind the actors; the texture and material of their kimonos; the beautiful lines of flower petals and the glistening rain drops that hang off of them. Colors are rich and nuanced, and the resolution is very good with a nice level of grain. In a later scene, the green neon of a bar light is both sickly and alluring, summing up the alcoholic experience in one neon brushstroke. 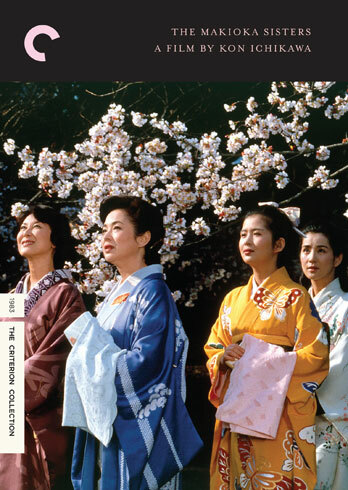 The Makioka Sisters is a gorgeous movie, rendered to its maximum prettiness on this Blu-Ray.